Wendy Mark (American, b. 1950), On The Road/Spain 2, 2011. Oil and graphite on prepared paper, 22¼ × 24½ inches (56.5 × 62.2 cm). Photo: Courtesy Jill Newhouse Gallery. 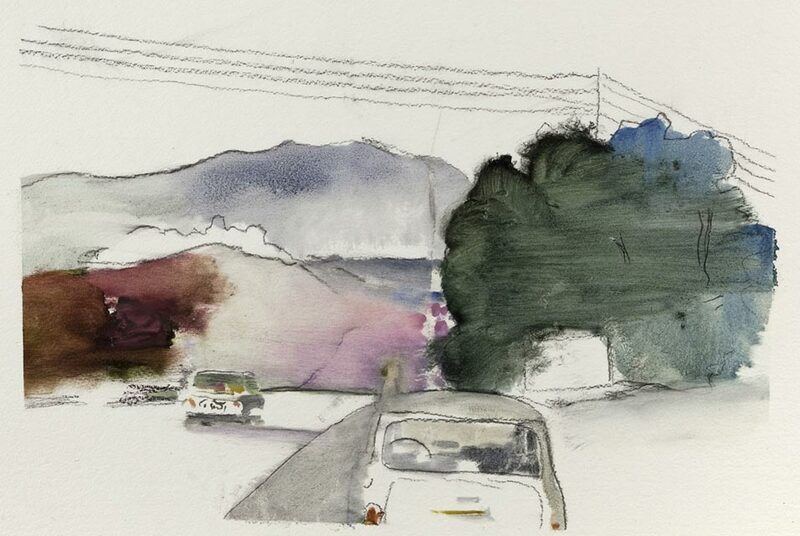 NEW YORK, N.Y.- Best known for her richly colored monotypes depicting abstracted landscapes, clouds and trees, Wendy Mark returns to watercolors and oils on paper while exploring the subject of cars at Jill Newhouse Gallery. Cars hold a strong sense of romantic narrative and nostalgia for Mark. As a child of the 1960s, she watched her father adopt and rehabilitate abandoned cars. Her visual ideas were shaped further by the growing importance of the automobile in American and European film, literature and music. Mark returns to this subject and lets the car become a moving architectural space, peopled with spectral images of men and women, in scenes of arrested narrative. In Drive, Mark heightens the narrative of family photographs with rich textures and colors. She records the surfaces of the car and the way chrome, glass, and plastic reflect light, and everything else around. Trees blur as they go whizzing past; images of streets and houses hint at events which remain undescribed. Marks commitment to works of art on paper echoes that of the gallery which specializes in master works on paper from the 19th to the 21st century, and particularly in the works of Corot, Delacroix, Bonnard, and Vuillard.